In the Summer 2016 issue of Skeptical Briefs, this column featured an interview with theoretical physicist Lawrence Krauss, who briefly mentioned his new popular-science book. The Greatest Story Ever Told—So Far was published by Atria Books in the beginning of March. It’s about the greatest intellectual journey ever taken by humans (so far) from Plato to the discovery of the Higgs’s boson. Krauss begins by reminding us of Plato’s Allegory of the Cave. As the allegory goes, people live imprisoned inside a cave only seeing its blank wall. The only thing those inside the cave see from the outside world is that wall, which is illuminated by a fire behind them, allowing moving shadows to appear. According to Plato, the prisoners of the cave consider the shadows part of the real world to the point of giving names to them. This Allegory of the Cave brilliantly introduces the book. 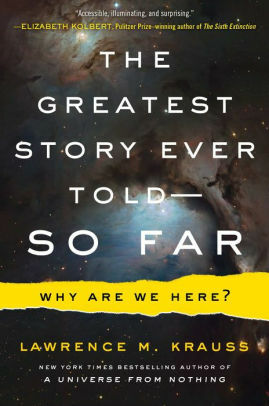 As Krauss uncovers through the book, a lot of what we learn about the universe, or the greatest story ever told so far, came from humans’ investigation about the nature of light. Newton’s curiosity about light, Krauss argues, might have been motivated because it was a gift from God. This is not a mischaracterization, since Newton devoted much more time to writing about the “occult, alchemy, and searching for hidden meanings and codes in the Bible—focusing in particular on the Book of Revelation and mysteries associated with the ancient Temple of Solomon—than he did to writing about physics.” So, Krauss thinks it’s also reasonable to conclude that Newton’s primary interest was in theology. Regarding light, Newton thought that it was made of individual particles he called “corpuscles.” Other natural philosophers, such as Descartes and Robert Hooke, did not share his view, considering that light was a wave. In their support, when passed through a prism, white light splits into the several different colors of rainbow. Even against it, some of Newtown’s discoveries about light made more sense with the “wave theory of light.” He discovered, for example, that each color of light has a distinct angle at which it bends when passing through a prism. He also showed that colored light does not change its color, regardless of how many times it passes through a prism. All of this could be explained if white light is indeed a collection of different colors, but not if light is made of different-colored particles (as Newton thought). It is hard to imagine any discovery that is more deeply ingrained in the workings of modern society. But more deeply, what makes his contribution to our story so remarkable is that he discovered a missing piece of the puzzle that changed the way we think about virtually everything in the physical world today, starting with light itself. If Newton was the last of the magicians, Faraday was the last of the modern scientists to live in the dark, regarding light. The mystery of the connection between electricity and magnetism continued until 1865, when Maxwell published his complete set of equations, connecting these two apparently unconnected phenomena together in a formal theory. He also showed that oscillating charges produce an electromagnetic wave. Then, critically, Maxwell calculated the speed of the electromagnetic wave and he found out what was almost identical to the already known speed of light. Light is an electromagnetic wave. There was a problem, however. Maxwell’s results concerning electromagnetic waves contradicted the properties of motion already established by Galileo many years before. If a ball is thrown with a speed of 10 mph inside a car moving at 15 mph, someone outside the car would measure the speed of the ball to be 25 mph (10 mph plus 15 mph). But what if instead of a ball inside the car, we have an oscillating charge? Maxwell calculated the speed of electromagnetic waves produced by oscillated charges measuring the strength of electricity and magnetism. Then, would someone outside the car measure the speed of electromagnetic waves from the oscillating charge to be different than what someone inside the car observes? If that’s the case, the observers would measure the strength of electricity and magnetism to be different from the other’s, allowing us to tell who is moving and who is not. But Galileo had shown this is impossible; there is no experiment anyone could perform that could tell if one is at rest or moving at a constant speed. Even though it’s a profound implication, Einstein was the one who realized it. The inconsistency is not just a thought experiment or between simple suppositions; both Galileo’s and Maxwell’s results have been verified by experiment. As Krauss remind us all, “rules that have been established on the bases of experiment cannot easily be tossed aside.” That’s why we needed Einstein’s genius to reconcile those notions. Einstein’s great solution was that, as Krauss explains, “the two different observers must both measure distances and/or times differently from each other in just such a way that light, at least, would traverse that same measured distance in the same measured time for both observers.” In Einstein’s theory of relativity, space and time measurements are observer dependent. Motion, electricity, magnetism, and relativity are all connected. That is just the beginning. The book continues to detail those hidden realities of our world, connecting in interesting ways many other physical phenomena, from the double-slit experiment and the rise of quantum mechanics (which uncovered the individual particles that light is made of) to unification of electromagnetism and weak force to superconductivity and the Higgs’s boson. Were it not for the progress of science—reason and experiment, instead of Plato’s pure thought—we would not uncover many parts of the hidden realties; we would still be inside of a Plato’s cave. And the job of scientists, as Krauss argues, is to see what is behind the shadows, separating illusion from reality. As the title suggests, the story is not finished: “Every day that we discover something new and surprising, the story gets even better,” says Krauss. Every page of the book you turn, it gets better. Krauss certainly has made a great contribution by describing the hidden realities in his fascinating book.